Ada pertanyaan untuk The Island Blue Hotel? Terletak strategis di Pulau Jeju, The Island Blue Hotel adalah tempat yang luar biasa untuk menelusuri kota yang aktif ini. Dari sini, para tamu dapat menikmati akses mudah ke semua hal yang dapat ditemukan di sebuah kota yang aktif ini. Dengan lokasinya yang strategis, hotel ini menawarkan akses mudah ke destinasi yang wajib dikunjungi di kota ini. Di The Island Blue Hotel, pelayanan istimewa dan fasilitas yang unggul akan membuat pengalaman menginap Anda tidak terlupakan. Sejumlah pilihan fasilitas kelas atas seperti WiFi gratis di semua kamar, toko serbaguna, resepsionis 24 jam, fasilitas untuk tamu dengan kebutuhan khusus, penyimpanan barang dapat dinikmati di hotel ini. Masuki salah satu dari 143 kamar yang menggoda ini dan lepaskan rasa penat Anda dengan sejumlah fasilitas yang tersedia seperti televisi layar datar, cermin, handuk, akses internet - WiFi, akses internet WiFi (gratis). Baik Anda yang menyenangi kebugaran atau hanya ingin bersantai setelah beraktivitas sepanjang hari, Anda akan dihibur dengan fasilitas rekreasi kelas atas seperti lapangan golf (sekitar 3 km), pijat, taman bermain anak. Apapun alasan Anda mengunjungi Pulau Jeju, The Island Blue Hotel adalah tempat yang sempurna untuk liburan yang menyenangkan. Tempat tidur bayi tersedia dengan biaya tambahan. Biaya ranjang tambahan belum termasuk sarapan. Terdapat biaya sebesar KRW 11.000 untuk penggunaan kereta bayi. Great location, service is good, staff is helpful and able to communicate in English. 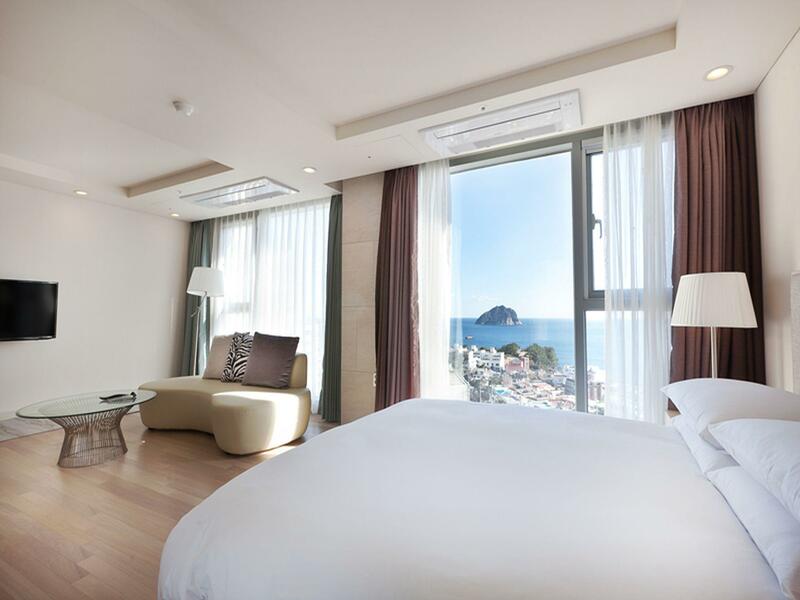 We have a nice ocean view room, just 2mins walk to reach black pork street and raw fish street, 8mins walk to Jungang Underground Shopping Street and 10mins walk to Dongmun Market. 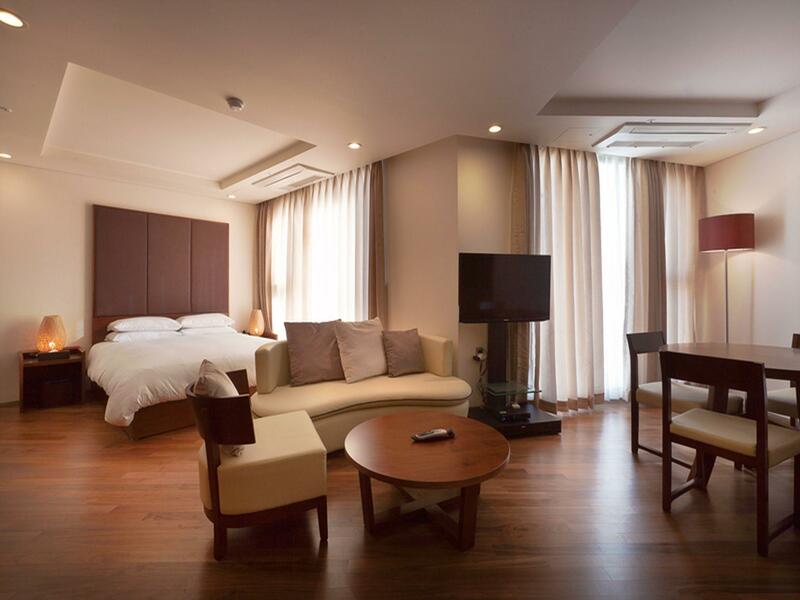 Located near to Olle market, this hotel room is easily located if you're driving. The room is very big however bed is not very comfy. They also provide free draft beer at night so it's a good place to mingle with your friends. Automated car park system is a little slow though. Overall a good stay. Though we did not book with breakfast. We were delighted to find that it is free for all guests. Breakfast is simple but filling. The Seogwipo Maeil Olle Market or shopping street could be a place to visit. Room is spacious. Think the aircon unit was right above the bed with pretty big bright blue light so may disturb your sleep unless you wear a blind to sleep. Whenever I travel to Jeju, I always stay at this hotel. The price is relatively cheaper than other hotels by keeping all high conditions(price, space, location, staff, cleanliness). The only difficulty I feel with this hotel is the "machinery parking". I hate to use that parking, and staff at the basement is not fully helping, but still I need to move my car and take out from it which sometimes make me uncomfortable.. Besides that every thing is very good. 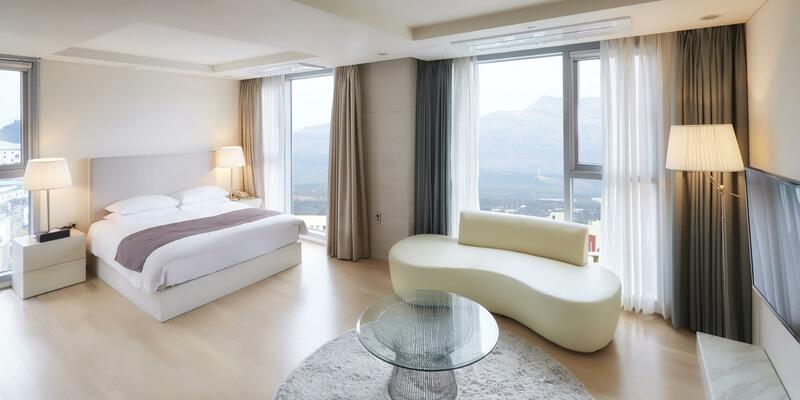 This is not the first time I stayed there, and continously will use the hotel whenever I travel to Jeju island. The room is very spacious and clean, and people who work there are very kind. The only issue I feel staying there is parking, since outside parking is not enough, and machinery parking should be taken care by drivers or only SUV cars can be parked in the basement. My family and stayed here for 4 nights and we were really happy to stay here. Has its own pantry and it was helpful to prepare food for my child. Walking distance to restaurant and grocery store. Overall really great stay! Very satisfied with the good quality of hotel, and clean condition. The room is very spacious and price is quite reasonable, even less expensive than other hotels. The only inconvenience I feel during the stay was auto parking garage, where cars are not coming out, but staff was very kind to support us all the time. Without the parking, it was very perfect and awesome and highly recommending. The room was super spacious, however, room lights keep flickering. When we went to the receptionists informing them about the light which are flickering, she does not understand us and thus, for the whole stay, we let the light just flicker around. Good thing is that the locations are not too far away from restaurants. The staff were kind enough to give us a free upgrade of our hotel room to a suite as the room we booked was no longer available. They claim they did not receive any bookings from me from Agoda. Please work on this in future Agoda. The room was big with complimentary water bottles but location abit far. Suitable for those want relax and not for those looking for happening night life. Travel to airport need 1 hour at least. Small kitchen with electric stove but no cooking utensils or pot. Not for cooking. This hotel have ample of parkings. The room is very big, but there are only 2 bottle water per day and nothing else, even no tea bag. Also, there is a open kitchen but no any utilities, so this is useless. The most important thing is, there is mosquito at my room. I have tolerated for 2 nights but eventually I requested for room changing. The staff told me that it is very normal to have mosquitoes there, speechless. The website said there is slippers but no at room. I asked the staff and they said that no provision after 1/10, but my fd’s room have. It’s ridiculous. All in all, I won’t recommend to stay at this hotel, really have bad experience. Btw, there are little choice for the breakfast, no good too. Big hotel room. No scenery outside the window. Room can be cleaner as few dead mosquitoes can be noticed on the wall. Will be good if can provide toothbrush & toothpaste set. Overall nice hotel with big comfortable room. Good location, plenty of parking space, large room, clean/new air conditioner, big fridge and freezer, spacious closet, and friendly staff. The first room we were in had molds on the hardwood floor and water was leaking out of it. We requested room change and they upgraded us to a much better room. The electric stove does not work in any rooms. There is a 24/7 coin laundry store just across the street from the hotel, which was convenient. room was spacious and huge by hotel standard. We took a partial ocean view offering a scenic view of the ocean and jetty. Located within close proximity to quite a number of eateries, all within walking distance and convenience store within hotel as well! Overall it's a cosy stay though lacking hotel frills like bathroom, which we didn't really mind. And hotel water, air on works well. I booked 2 rooms for 3 nights. The rooms were clean and spatious. We didn't have any meals at the hotel so I can't comment on their food. There is a play area for the kids and you can also get a massage. Parking is provided and there is someone on duty to help you with parking which was nice. I definitely recommend this hotel to others. The stay was good. But it's really hard to adjust the room.tempature coz the AC control is all in Korean. And it takes time to get back your car since it is automatically parked in the basement that you cant access. The bed of the room was very comfortable, so was the blanket. The room and building looks new, so the hotel may be a few years old only. There is a dedicated carpark if you have rented a car or scooter for driving around Jeju. For the amount of money, the hotel I feel is considered very good. Recommended for those going to Segowipo area in Jeju. It was much better than I have seen in the photos while I booked the hotel. It looks more like a service apartment with kitchen and a very comfortable sofa! 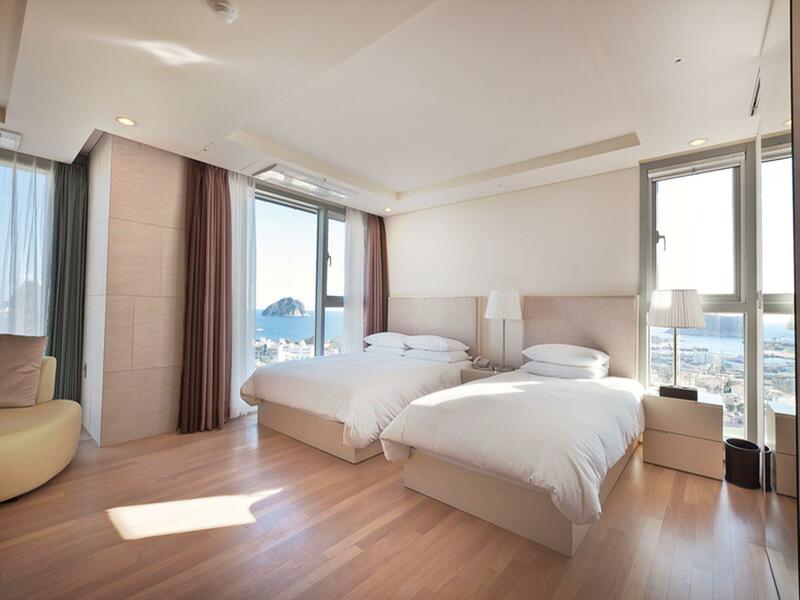 I highly recommend this hotel to my friends who tend to go to Jeju Island!